Using the right social media tactics will determine success or failure for your social media marketing campaigns. This is also one of the core reasons why so many business owners feeling the enormous pressure in using the right tactics for their business. Make no mistake, it is always easier said than done. Finding the right social media tactics can drive your business to new heights, or burn a huge hole in your pocket that would take time recover. 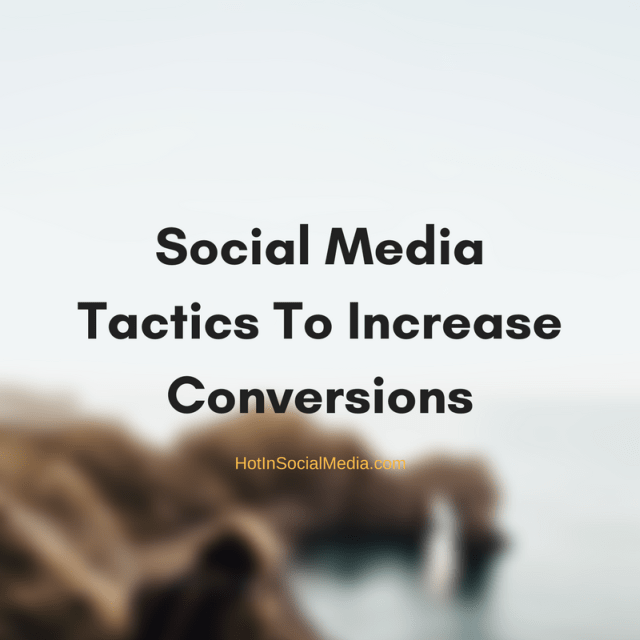 Either way, this article will highlight some of the best social media tactics to increase conversions. Are you ready to dive in yet? Videos can go a long way. Businesses who have this social media tactic in place often see a huge bump in their conversions. You see, the usual and old school imagine and a wall of texts doesn’t make the cut anymore. If you don’t believe, YouTube had previously said that on average, a YouTube user spends around 5 hours a day watching videos. And trust me, the figures are very daunting to say the very least. Video marketing is powerful because it allows you to boost engagement in many ways, even after the video has ended. In most cases, videos always have a longer lasting effect compared to any other forms of media. Pretty impressive for starters, right? Publishing the right message is critical. Believe it or not, many social media marketers find this very challenging (including me at times). Using the right message is critical because you wouldn’t want to share the wrong message which can be interpreted and leaving a negative impact. Sending out the right message is just one part, sending out the message at the right time is another. In this case, there is no point publishing a message at 3 a.m. unless you have a wide range of international audience. There are several ways you can achieve such. For starters, you can use third party tools such as Buffer and Hootsuite to send out timely updates based on the right time. Of course, you can manually do it but personally, system and programs will always work better than a normal human being can do. When you publish posts at the right time, you have better chances of getting better conversions which will impact your marketing dollars. Do you know that the right headlines are going to turn heads? In many cases, people are not using the right headlines to increase conversion. As a matter of fact, we are all human and we are basically hot-wired to be attracted to things that are psychologically interesting. 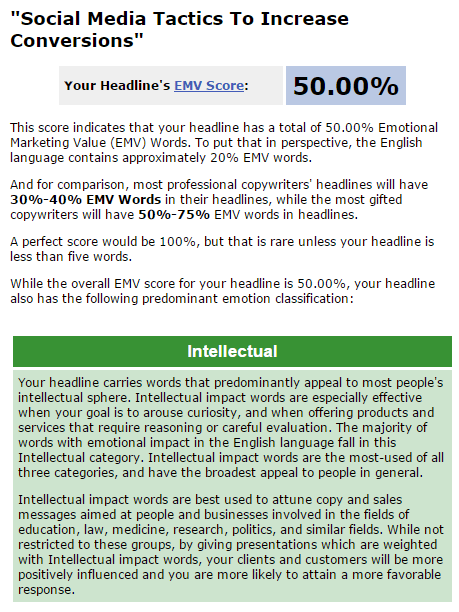 The headline chosen was “Social Media Tactics To Increase Conversions” and while this title may just seem to be normal, it holds a strong intellectual score. This means that we are more intrigued to click and read when we see the headline as such. You can check out the tool using this link. Numbers don’t lie and to be honest, increasing the number of posts can increase your conversion rate by miles ahead. If you want to have better conversion rate, then you should focus on publishing more posts! For starters, not everyone is going to read every post of yours. So by logically speaking, you are going to get more eyeballs on your posts if you start increasing the numbers of posts you are planning to publish. This is the same concept when you talk about using Facebook ads for example. Have you noticed that certain advertisements keep popping up on your timeline? According to news and television stations, it takes roughly seven to eight advertisements before a person finally remembers the ad shown on television. And the same goes to radio stations as well. So, if you want better conversion, consider increasing the number of posts. The usage of hashtag may be old school, but it can double your conversion rate in many ways. The hashtag marketing is easy to use and if you have problems starting up, consider using both of these services: Twitonomy and Hashtagify. The answer is yes. You can still use hashtag marketing in industries such as casino, online gambling, multi-level marketing and much more. With social media marketing, anything can be done and nothing is impossible. Personally, I have seen many online gambling and casino owners who managed to increase their conversion rate when they use a hashtag for marketing. Typically, Facebook and Twitter marketing. Last but not least, visuals are great tools to increase conversion rate. And this means that the whole 9-yard from images, memes, and infographic. Jokes aside, content that high visual contains can easily improve the conversion rate. This is also the reason why advertisers on Facebook ads are using videos to reach out to a wider audience. So, what can you do to leverage on this? One of my favorite strategies is to hunt for interesting visuals on GIPHY. You can easily embed visuals in any social media platforms by copying the code or the URL which will be provided. While this is simple, it can easily increase your conversion rates effectively and with very little work. Pretty awesome, right? There are many things that you can do to increase the conversion rate for social media marketing and I hope you find the above 7 tricks useful. Feel free to leave a comment and share your thoughts below!